Guitar maker John Guilford created the guitar in honor of the eight airmen and one contractor killed in Afghanistan April 27, 2011. An electric guitar built in honor of eight airmen and a civilian contractor killed one year ago by an Afghan turncoat debuted at the Dallas International Guitar Festival over the weekend. Guitar maker John Guilford spent two months crafting the custom instrument after he was approached by Maj. Henry Cecil and Lillian Axe, a hard rock band from New Orleans. Cecil worked for a year as an air advisor in Afghanistan and served with three of the nine who died when an Afghan colonel turned his gun on coalition forces inside Kabul International Airport April 27, 2011. Cecil is also friends with Louisiana Music Hall of Famers Lillian Axe, which uses Guilford Guitars. Guilford, who builds guitars in his backyard shop in Glasford, Ill., said he considered the request from Cecil and Lillian Axe for about a day before agreeing to take on the project. The front of the guitar is covered in a portion of the airman battle uniform worn by Maj. Henry Cecil during his year-long deployment to Afghanistan. 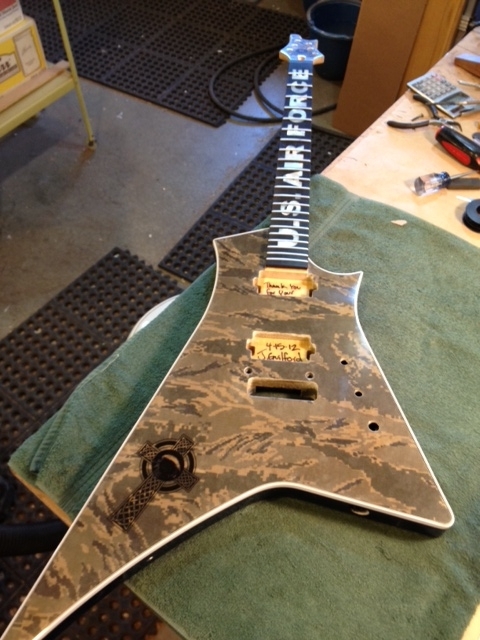 Guilford covered the front of the guitar in the camouflage airman battle uniform Cecil wore in Afghanistan. The words “U.S. Air Force” cover the fingerboard in mother-of-pearl inlay. The back plate lists the names of the nine killed: Maj. Jeffrey Ausborn, Maj. Charles Ransom, Master Sgt. Tara Brown, Maj. Philip Ambard, Maj. Raymond Estelle II, Capt. Nathan Nylander, Maj. David Brodeur and Lt. Col. Frank Bryant and contractor James McLaughlin, an Army veteran. The words “Take the Bullet” refer to a song the band wrote to honor military service men and women. Cecil said the guitar will be raffled off to raise money for the Air Advisor Memorial underway at Joint Base McGuire-Dix-Lakehurst, N.J. A drawing is planned for Veteran’s Day. 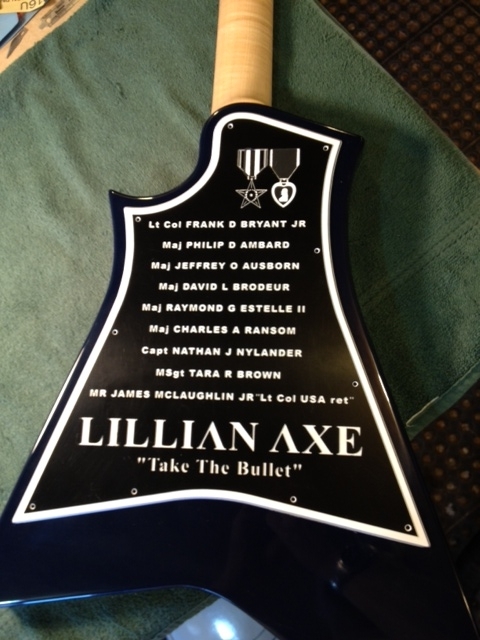 Lillian Axe will tour with the guitar throughout the summer. For more information, visit www.airadvisormemorial.org/home/Tribute_Guitar.html. It’s a generous gesture, good luck with the fundraising events and raising money for the Air Advisor Memorial.